The Seattle theater community is severely lacking in Spanish works, which is why I was so eager to attend Bernie’s Apt., a modern rendition of Federico Garcia Lorca’s La casa de Bernarda Alba (The House of Bernarda Alba). In a bilingual Spanish/English production, playwright Rose Cano, like Lorca, tells the story of a family of women who are–for one reason or another–confined to their home. Whereas Lorca was exploring the repression that women experienced during the dictatorship of Franco, Cano is concerned with issues that are ongoing in contemporary American society: mental illness, the hardships of (legal and illegal) immigrants, and the foster care system. As an adaptation, Bernie’s Apt. functions brilliantly. Bernie, our modern Bernarda Alba, is struggling to provide for her four hijas, and ensure that they become respectable girls who finish high school. Except for one, these daughters all came to live with her through the foster care system, their parents having been deported, imprisoned, or murdered when they were younger. In this respect, Bernie’s Apt. is a great insight into the hardships that immigrants face today–both before they arrive here and after. Although Maggie, Marti and Adela are certainly grateful for Bernie’s support–after all, they have become a family–it is also clear that her presence is an overbearing one. In trying to keep her daughters off of the streets, Bernie effectively keeps them from leaving the house, teaching them that getting ahead in this world is only an illusion, and that they’re best off right at home. Further ensuring their confinement to the apartment are lack of financial prospects, issues with immigration statuses, and–for Angie, Bernie’s blood daughter–mental illness. In Lorca’s play, this repression is ultimately and inevitably tragic: jealous and yearning for freedom, the youngest daughter, Adela, lashes out by attracting her eldest sister’s fiancee to her window at night. When the unspeakable truth comes out, Adela commits suicide, seeing no other options for a woman in her position. Cano’s adaptation offers a realistic modernization. Finding herself unable to forget her troublesome past and pregnant, Adela leaves Bernie’s apartment and takes to the streets. Although we watch as she gives up her daughter, we are left to wonder what will happen to Adela next, and reflect that the baby will likely face her own troubles growing up in the foster system as well. The Spanish Bernarda is triumphant in the end, unemotionally maintaining order in her home after the death of her daughter. Our Bernie is a more dynamic character. After being incarcerated for theft, Bernie concedes that it was her daughters who saved her, not the other way around. Ultimately, Bernie’s Apt. is a celebration of the resilience of these latina women, who keep struggling on no matter what they are confronted with. Of course, the more minor of these struggles are more humorous than they are tragic: the everyday chaos typical of large families, the dynamic of mothers and daughters, the broken English of new learners. (I should note here that, although much of the Spanish dialogue is repeated in English, some is not. Those unfamiliar with the language may have a hard time understanding minor plot points, and will certainly miss out on much of the comic effect.) Where the play struggles is in the sometimes flawed delivery of the lines, which have a tendency to be somewhat cheesy; and in its being perhaps too drawn out in the second act. Still, the production is a powerful one, and I recommend that you all visit Bernie’s apartment soon. Bernie’s Apt. eSe Teatro. ACT Lab. 700 Union St, Seattle, WA 98101 (Downtown). 7:30pm Thurs-Sat and 2pm Sun. May 5th-28th. 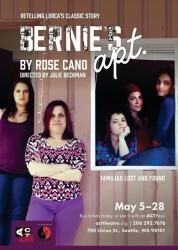 Tickets at http://www.acttheatre.org/Tickets/OnStage/BerniesApt.